NTT DATA MSE Corporation will make a breakout session and a demonstration at the Automotive Grade Linux All Member Meeting (: AMM), which will be held from Feb. 20th, 2018 in Tokyo, Shinjuku, hosted by Automotive Grade Linux (: AGL) and The Linux Foundation. In the breakout session, Hiroto Imamura, Manager, and Daisuke Nomura, Deputy Manager will give a presentation on " Solution Approach in Integration of AI Engine into AGL ". We will exhibit two demonstration systems at our booth. In order to verify the possibility of realizing Edge AI, i.e., use AI on edge devices, our company has implemented the handwritten number recognition application on AGL. The application crops a specific area of an USB camera image and shows inference result of an AI Engine. The deep learning framework which is called Neural Network Libraries (NNabla)*1 has been used as the AI Engine. By applying data augmentation*2 technique to the training data set and pre-processing of the camera image, recognition rate has been improved. Processing time of the inference by the AI engine is about 2 ms*2. Our company has confirmed the possibility of utilizing Edge AI for various use-cases in the future. Figure 1. Overview of " Integration of AI engine into AGL and Verification of the Possibility of the Edge AI "
Our company implemented Movie Playback application and Map application for SDL onto AGL. As a measure against driver distraction*4, contents on a display can be switched using vehicle data acquired via IVI systems. 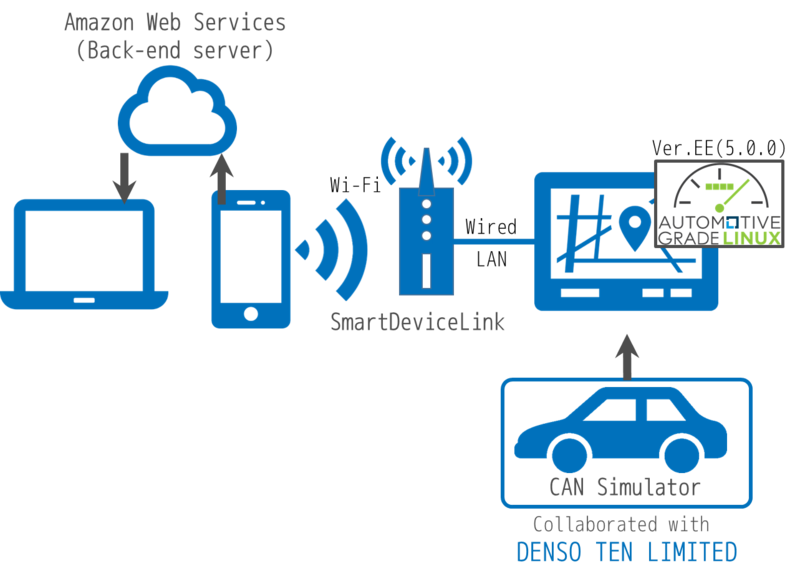 Aiming at further development of AGL, we collaborated with DENSO TEN, which is a member of AGL on building a demonstration system. Figure 2. Overview of "Implemented SDL application and leverage vehicle data"
■ SDL application is a mobile application that works on both Android™ and iOS™ platforms and supports Movie Playback and Map Display. ■ Vehicle data which is acquired with SDL is uploaded to the cloud (AWS) via a smartphone and it can be browsed using computers or mobile devices. ■ As a countermeasure against driver distraction, contents on a display are switched while driving according to the acquired vehicle data. Our company will contribute to drive commercialization and practical realization of both AGL and SDL forward through organizing and performing collaboration with the other AGL related companies or function extension. * iOS is a trademark or registered trademark of Cisco in the U.S. and other countries and is used under license. * "AWS" is a trademark of Amazon.com, Inc. in the United States and other countries. * Company names, product names and logos mentioned here are trademarks or registered trademarks of each company.